T-Mobile has unleashed the Blackberry Curve 8900 for people in the US. The phone was initially released on January 27 for carrier’s business customers only. It can now be purchased online or at T-Mobile stores nationwide with the condition that the users need to sign up a two-year contract for the price of $199.00 (after a mail-in rebate). 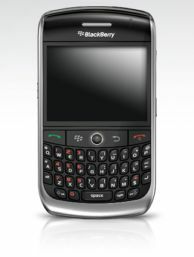 The BlackBerry Curve 8900 features a large 2.4 inch vibrant screen with high resolutions of 480 X 360 pixels. The Blackberry Curve 8900 is also an easy-to-use device that delivers expanded functionality and reliable results. Camera- 3.2 MP camera (JPEG Encoding) with auto focus, image stabilization, flash and 2X digital zoom. Video Camera – Normal mode with 240×180 pixels and MMS mode with 176×144 pixels. GPS & BlackBerry Maps – Assisted and autonomous GPS enabled. Enhanced Media Player – Support variety types of audio and video format. Data Input & Navigation -35 key backlit QWERTY keyboard, intuitive icons and menus.